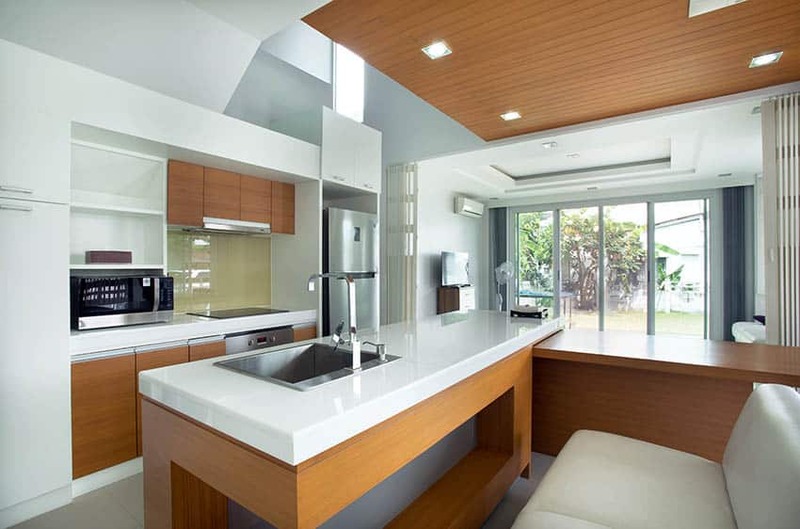 Here we share our modern galley kitchen design ideas including a variety of cabinet, colors, finishes and floor plans. 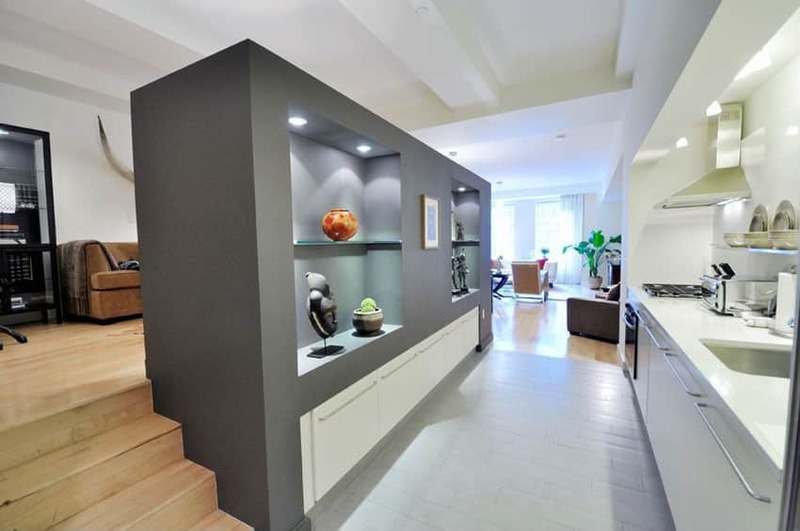 Modern galley kitchens refers to spaces which have a narrow hallway in between 2 parallel walls which often both have kitchen cabinets and counters. Galley kitchens are common in older houses and smaller spaces. One of its advantages, which could be seen as a disadvantage to some, is that it is isolated from the rest of the home’s floor plan. Which means the cooking smells coming from the kitchen do not easily penetrate furniture and curtains in your living area. The separate space can also keep your cooking prep work out of sight and away from guests. Galley kitchens, when planned well, are also known to be ideal when it comes to workflow efficiency. This type of kitchen allows you to easily multi-task and access different parts of the kitchen without moving around too much. However, it’s advantage also result in a slight disadvantage. 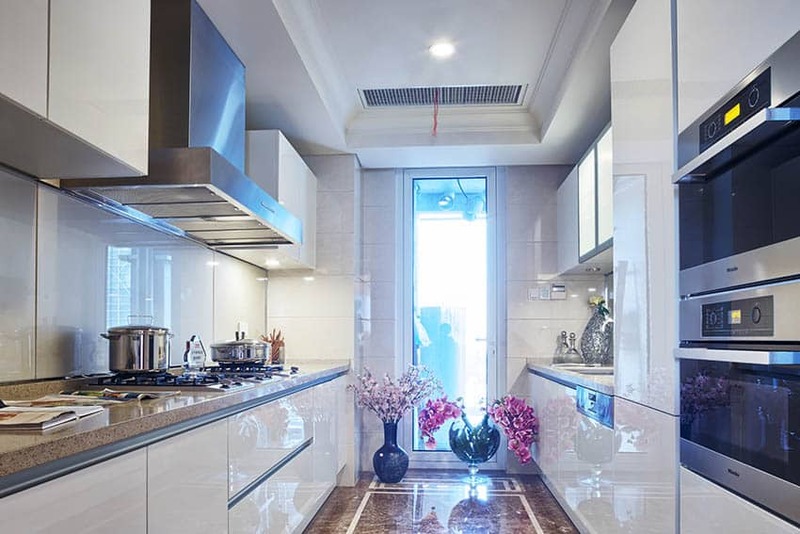 Because of the narrow hallway of galley kitchens, it is not an ideal kitchen space if there is more than 2 people working in the kitchen simultaneously. 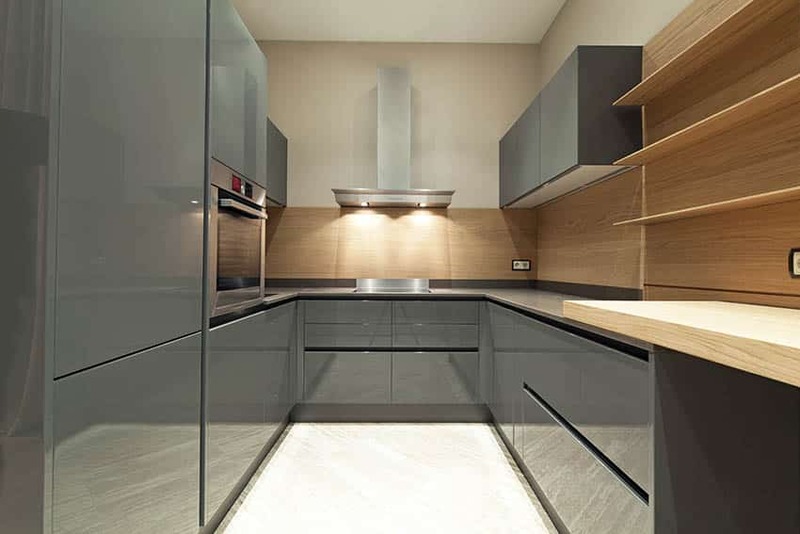 Modern design principles usually work well with galley kitchens. Modular cabinet modules, high-tech fixtures and hardware, as well as built-in technology allows you to maximize the limited space available. Taking into account your personal kitchen use habits/routines, taking guidelines from the “kitchen work triangle” would definitely help you plan and design your kitchen to the layout that best works for your preference. 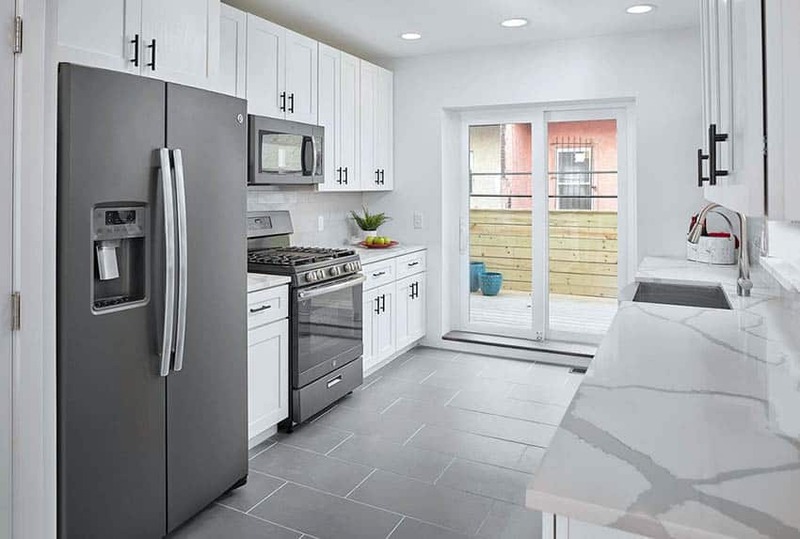 The modern galley kitchen featured in the picture above is going for an all-white theme and uses modular laminated cabinets and built-in kitchen appliances to create a very clean and sleek look. See more modern white kitchen designs here. The wet and dry areas were placed on opposite sides of the wall in this small galley kitchen layout. For that clean modern look, it uses laminated modular cabinets in gray, paired with stainless steel pulls for a clean and contemporary look. 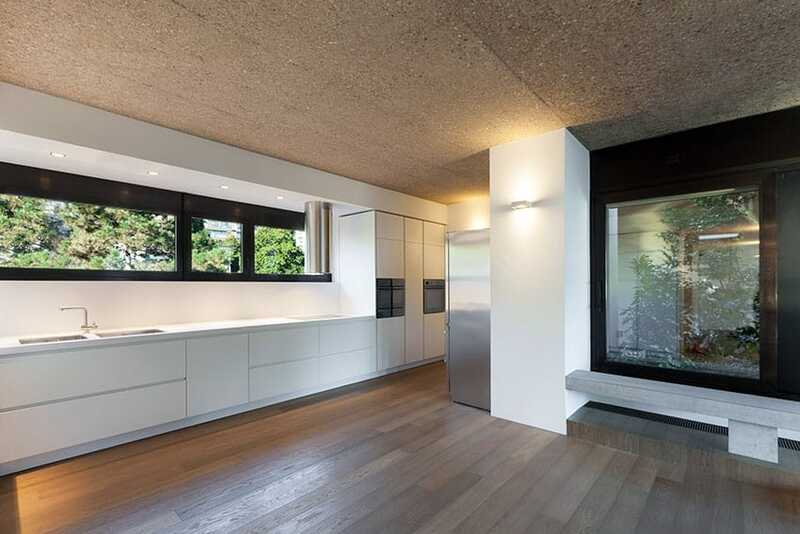 Unlike the other examples, this galley kitchens is still adjacent to the living area. And instead of a full wall to separate the kitchen from the rest of the house, the other wall is only half the height, to more efficiently dissipate smoke and heat from the kitchen area. 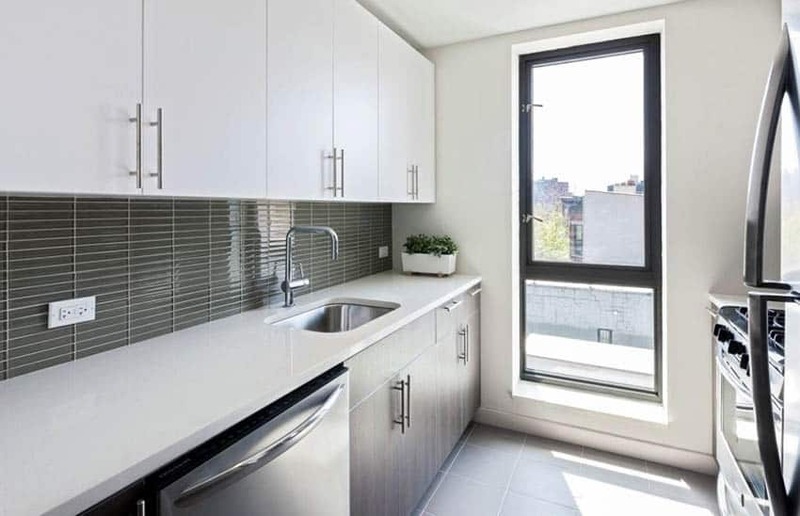 It uses all white modular kitchen cabinets, as well as a solid surface countertop for a clean look. A blue back-painted glass was installed as backsplash to add an accent color to the small space. A galley kitchen can really benefit from the use of a window to brighten and help make the space look bigger. 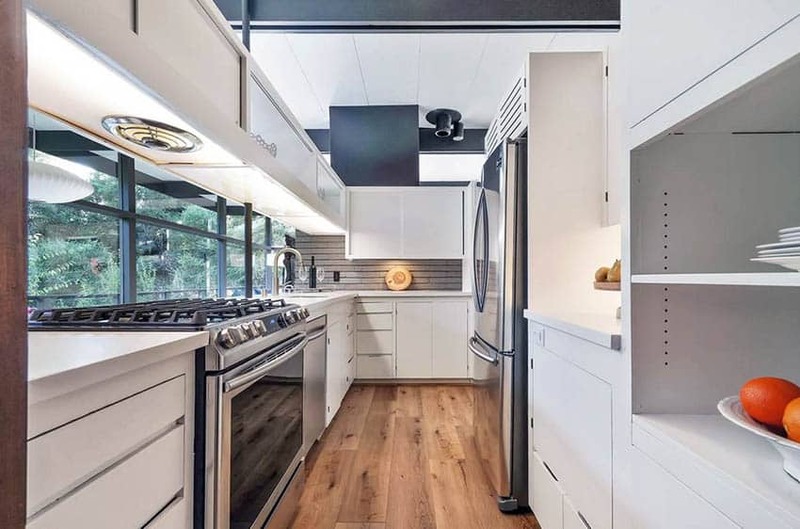 This modern galley kitchen uses two type of cabinets a dark wood for the base with high gloss white uppers combined with white quartz countertops with stylish results. Having plenty of natural light can help offset the use of darker cabinetry to keep your space bright and appealing. This beautiful coastal design modern kitchen offers plenty of natural light through an abundance of windows. Using glossy white modern kitchen cabinets and plenty of recessed lighting helps to keep the space looking bright and airy. The floor plan opens up to a wide dining room area further enhancing the galley kitchen design. The hallway for this kitchen is a bit wider, and the space generally bigger than usual galley kitchens. It combines modular cabinets with golden walnut laminates & black granite stone for the countertop and back splash for a very bold contrast. This is a very unique modern galley kitchen design. 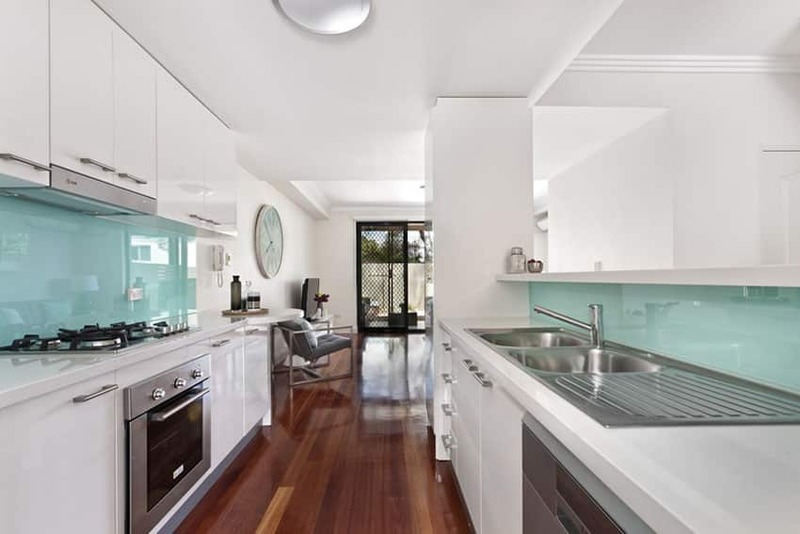 Unlike the other examples wherein the kitchen is in a separate area, this kitchen is situated in the middle of the layout. A low wall divides it from the entertainment area/family room situated on a raised platform behind the low wall. The kitchen has an all-white color scheme to make it blend in with the wall. To make this galley kitchen semi-open, half of the wall was taken down to make way for a small kitchen counter, creating a small dining space for quick meals. 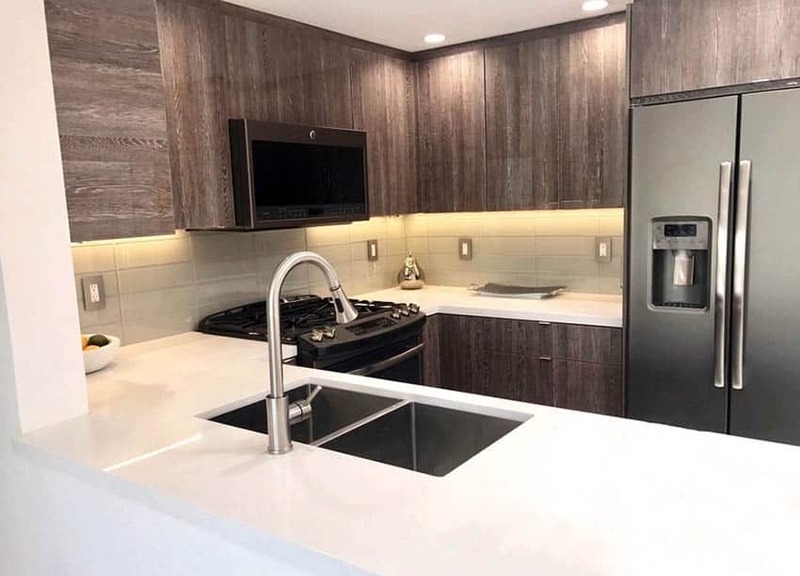 This contemporary kitchen goes for a very bold wood choice for its base cabinets – it uses modular cabinets veneered with zebra wood, combined with plain white counter tops and overhead cabinets to tone down the bold tone of the base cabinets. 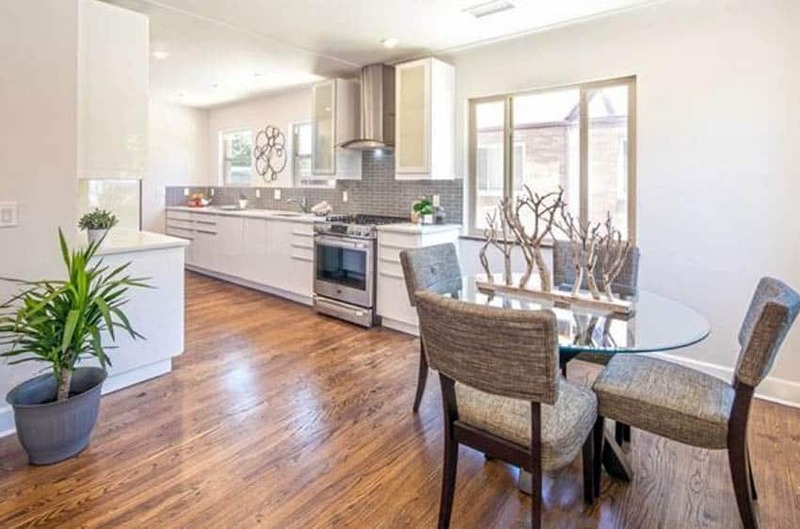 This galley kitchen has a unique layout, in which half of the countertops are open to the rest of the house, while the other half is hidden on the corner of the space. 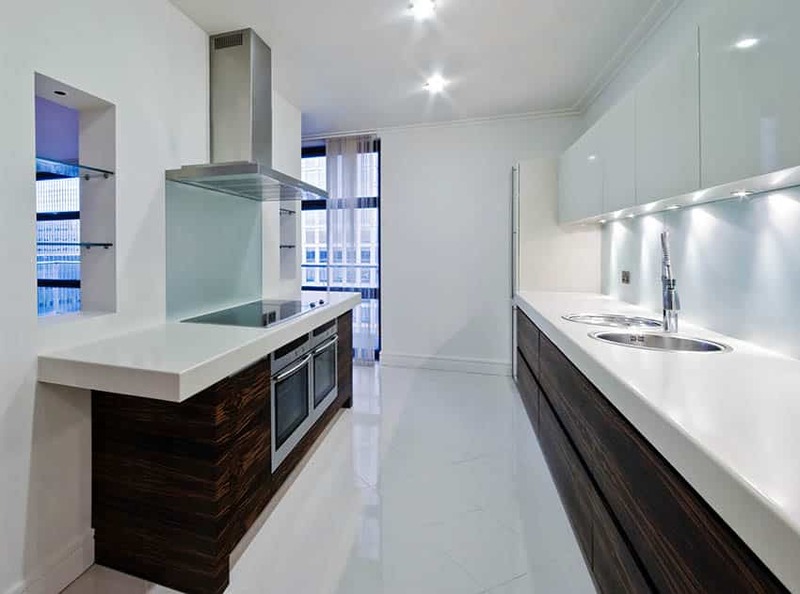 It uses white laminated modular cabinets as well as plain white solid surface counters for a clean and modern look. 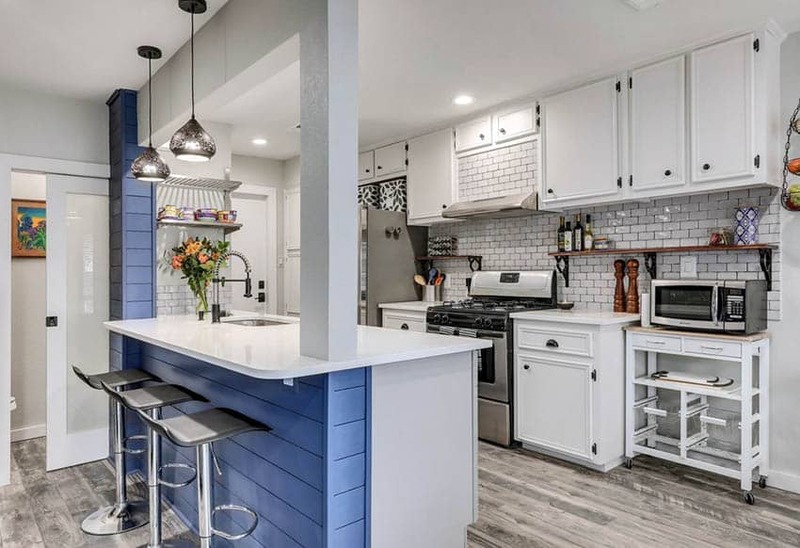 Since this kitchen has a little more width, instead of putting 2 parallel kitchen wall counters, it instead used an island counter, leaving the other wall open, with enough space for counter seats and shelves. 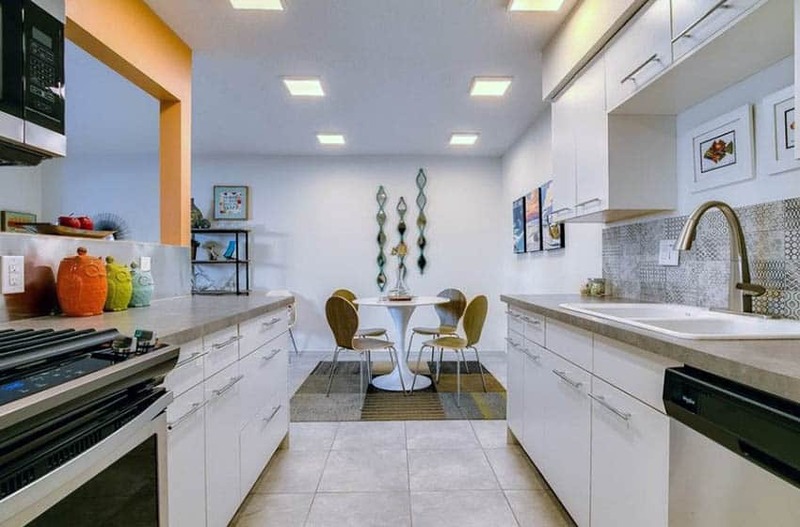 The horizontal lines are especially highlighted in this design, because of the continuation of the horizontal pattern on the flooring and the backsplash tiles. Similar to the previous kitchen, this modern galley kitchen uses a bar counter parallel to the main wall counter. The color scheme features a very bold contrast of dark wengue combined with the sleek and smooth edges of stainless steel. The result is a very clean and modern kitchen look. 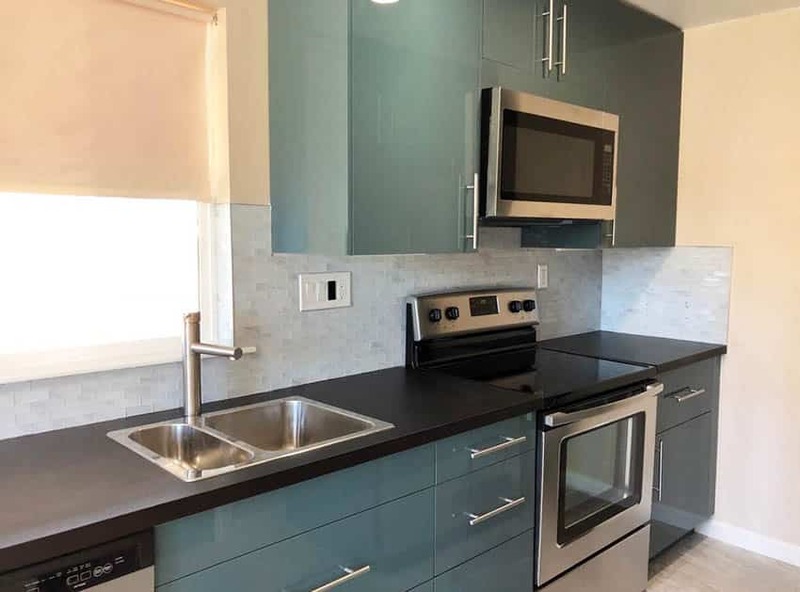 For those who are a little short on budget, using modular laminated cabinets might break the bank, but this kitchen shows a really nice DIY Galley kitchen example you can try yourself. It uses unfinished plywood, and simply uses a clear coating to protect it from water and moisture. 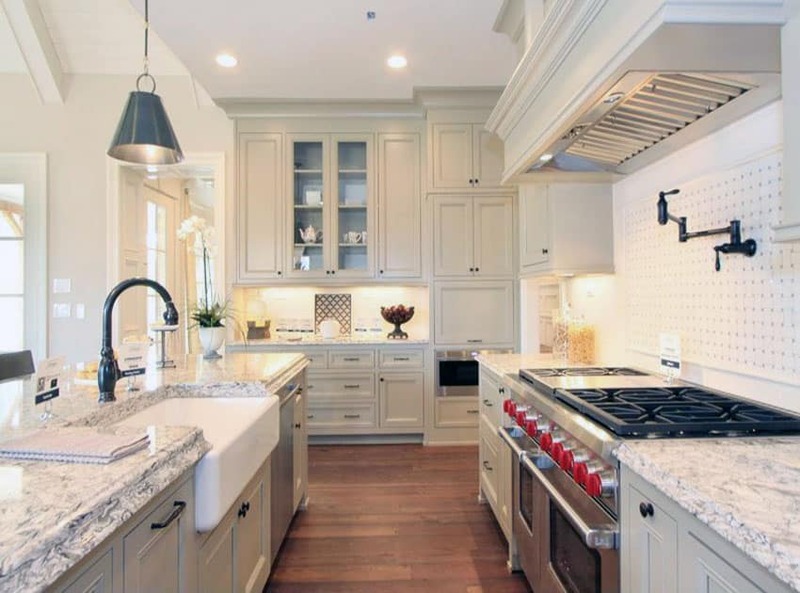 Farmhouse style kitchens have been gaining renewed popularity in recent years. In fact, many have been remodeling their kitchens into the modern farmhouse style. This is mostly because people tend to like its very eclectic look and its casual warmth that gives a very “homey vibe”. Modern farmhouse style kitchens often blend in easily with any existing styles in the house, so it has really been a popular choice. 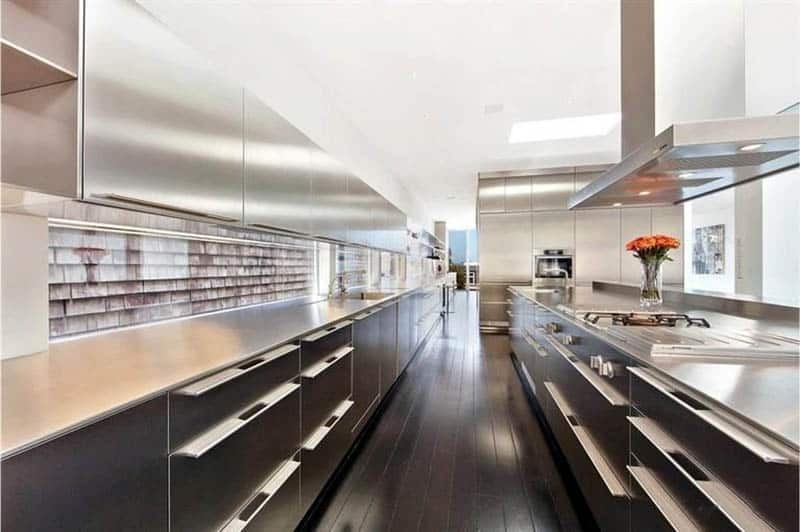 This galley kitchen has a wall cabinet parallel to a kitchen counter. Vintage-style fixtures have been installed, such as the basin sink, oiled copper faucets and pulls, to recreate that old farmhouse look. Because of the smaller space, this galley style kitchen has shaker style kitchen cabinets, also typical of modern farmhouse style kitchens. For a more contemporary look, the cabinets were painted in white and paired with white marble countertops for a clean and seamless look. The advantage of having a kitchen island is that you are able to use 2 or more sides of the countertop, allowing you to use it for multiple purposes. For most, kitchen islands not only serve as additional work top, but also function as a small dining area, bar table, as well as a low divider that subtly separates spaces in open plans. 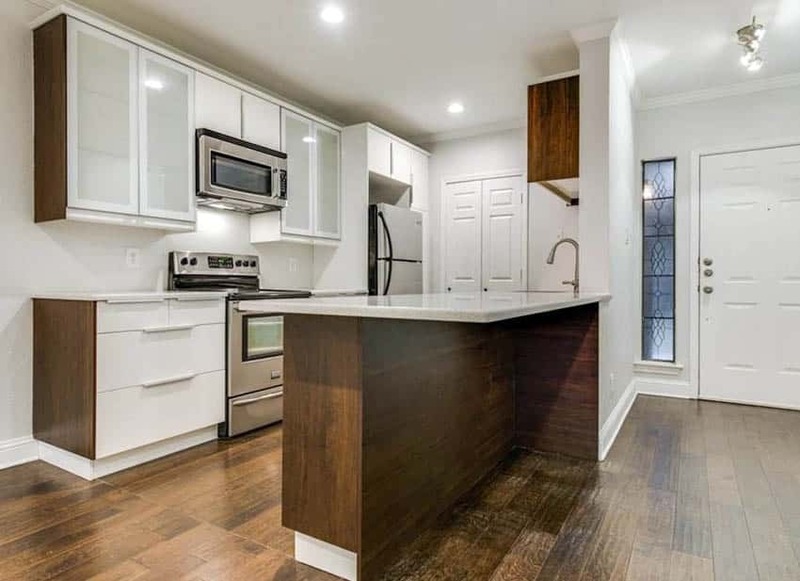 This contemporary style galley kitchen features small and compact modular cabinets paired with a small island counter which also has the sink and also functions as a small dining area. The kitchen island helps separate the kitchen space from the other common areas of the house. 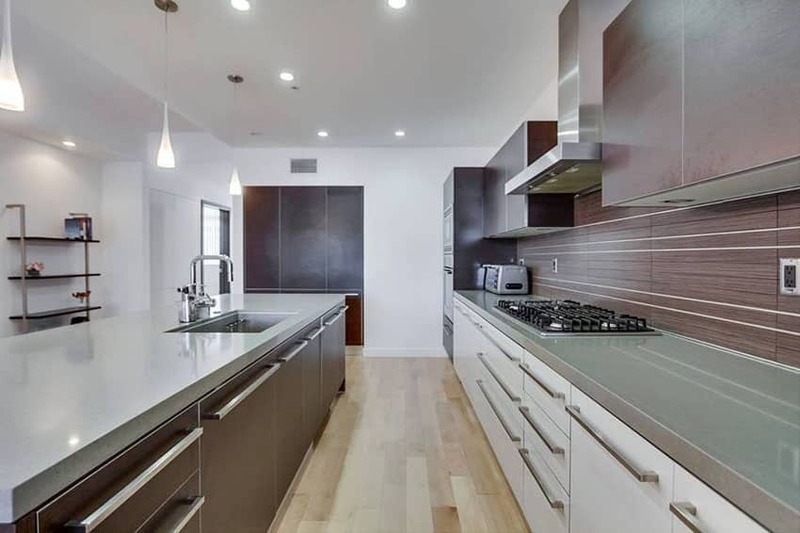 This ultra modern galley kitchen features all white cabinets and countertops, with some small silver accents that matches with the overall minimalist aesthetic of the space. The large kitchen island has a lot of storage space and countertop space, so it is definitely a very functional addition to this small kitchen. A kitchen peninsula is a great addition to rooms; with a small floor plan that can not accommodate the full size of an island. Peninsulas provide extra counter space for food preparation and eat in dining. 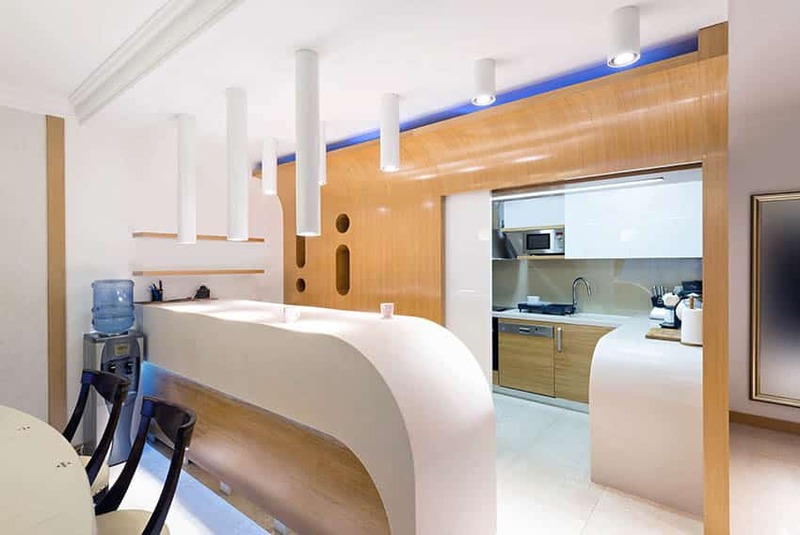 By removing part of a wall one can transform a small galley kitchen design in to a space with a functioning peninsula. This small u-shaped kitchen features attractive wood veneer cabinets combined with white quartz countertops for a stylish design. Compared to the previous modern kitchen, this kitchen design uses more curved forms for its counters and wall accents to create fun and fluid feel to the space. A peninsula counter was also added to the space, helping separate the kitchen from the dining area, as well as functioning as a bar counter. Mid century modern style in general has maintained its popularity through the years. Mid century modern kitchens are often characterized by its simple forms, soft palette, and the addition of subtle accents such as gold, or light-colored wood. The clean and simple appeal of mid century modern kitchens makes it very timeless, but at the same time, allows your personal style to shine through. This small galley kitchen is a little experimental with its color scheme and the combination of vintage appliances and accents. 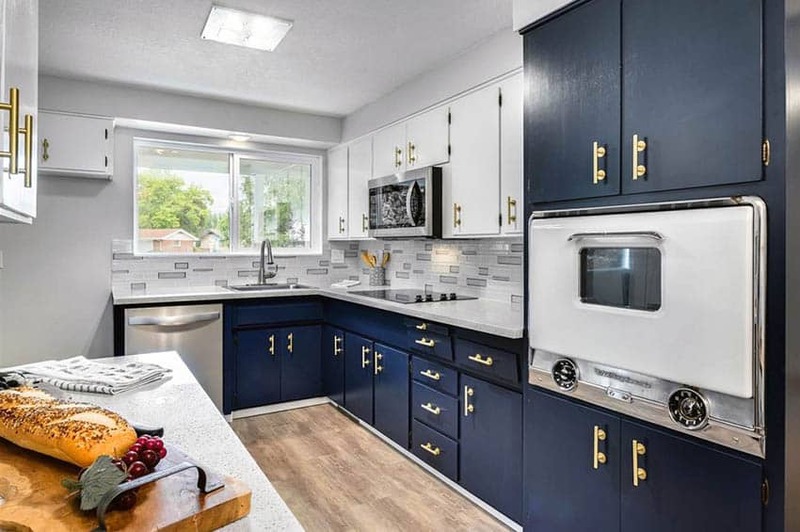 The dark blue base cabinets creates a bold background that makes the gold cabinet pulls stand out, while the white countertop and overhead cabinets helps tone down the dark tone of the base cabinets to create a perfect balance. Despite its small, narrow layout, this galley kitchen still feels airy and spacious, thanks to its large windows that spans the whole length of the kitchen. Combines with combination of matte white and soft oak floors, this galley kitchen is a poster-child of the simple elegance and charm of mid-century modern kitchens. This mid-century modern kitchen taps on the more vintage classic inspired style, as it uses paneled cabinets with oiled copper hardware. 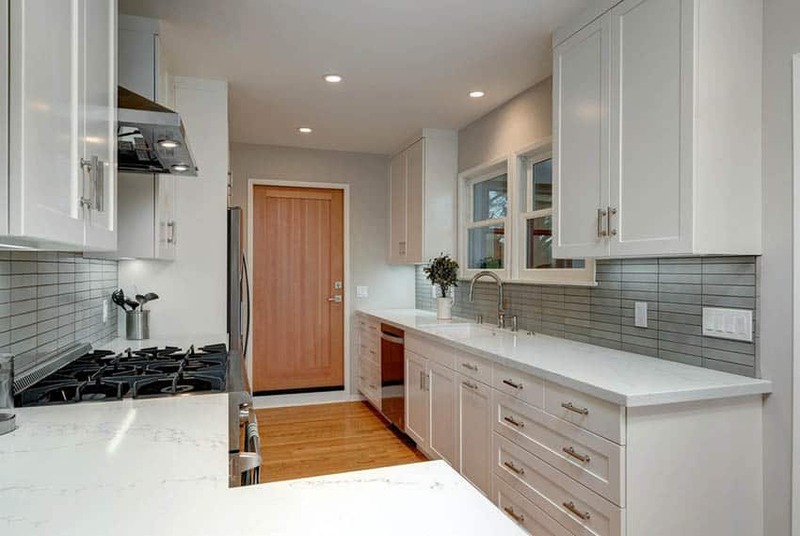 The addition of white subway tiles and open shelves is also very mid-century style. 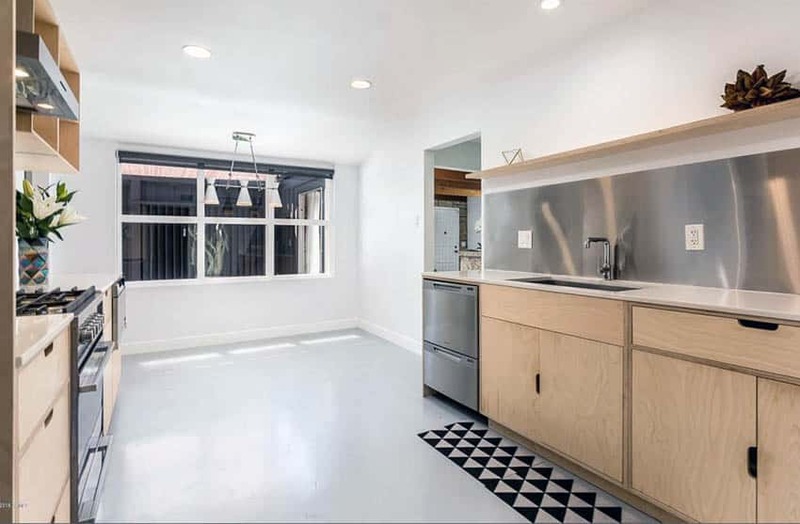 Keeping it clean and simple, this mid-century galley kitchen goes of a combination of clean lines and very subdued colors that perfect matches the overall theme of the space. Due to the small space, this galley kitchen uses mirrors to help make the space look larger. It also makes sure to maximize the while height for its overhead storage. 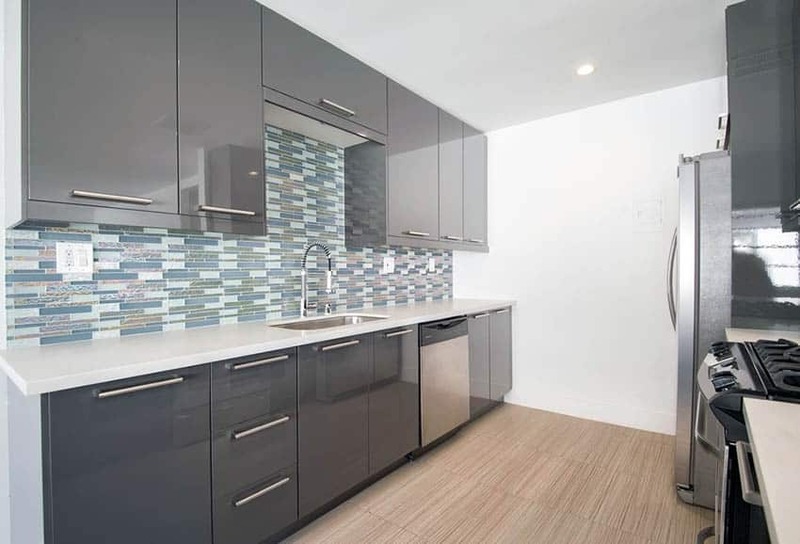 Glossy green cabinets combined with black corian countertops and white glass mosaic tile backsplash make up this small modern kitchen design. 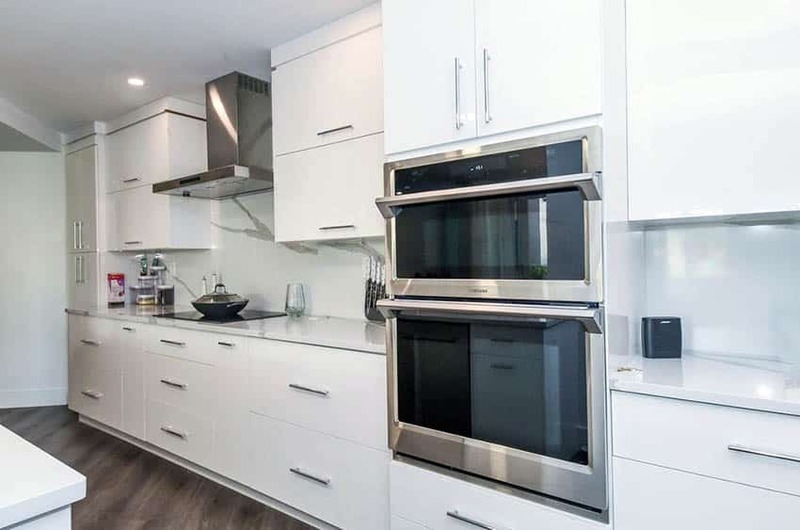 Since this galley kitchen has a rather small area, it uses white laminated modular cabinetry to maximize the space, combined with U-channel pulls so that you don’t have to worry about hitting cabinet pulls every time you pass by the tiny hallway. 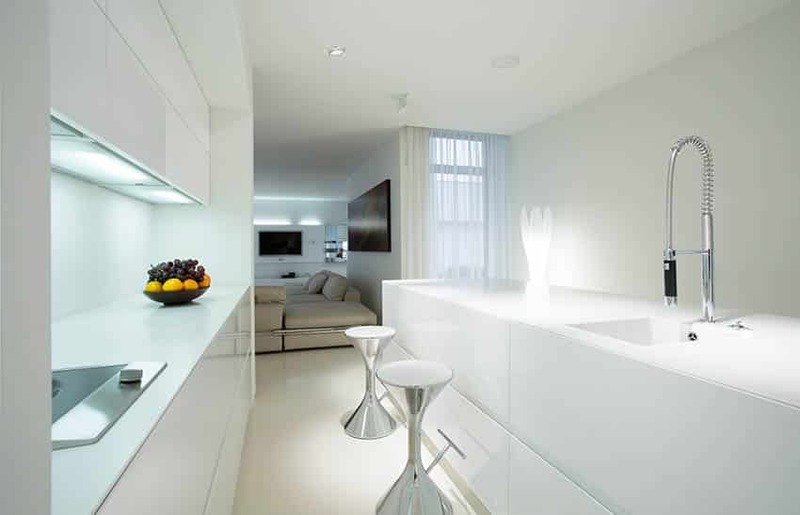 The use of white also helps reflect light and make the space feel big. 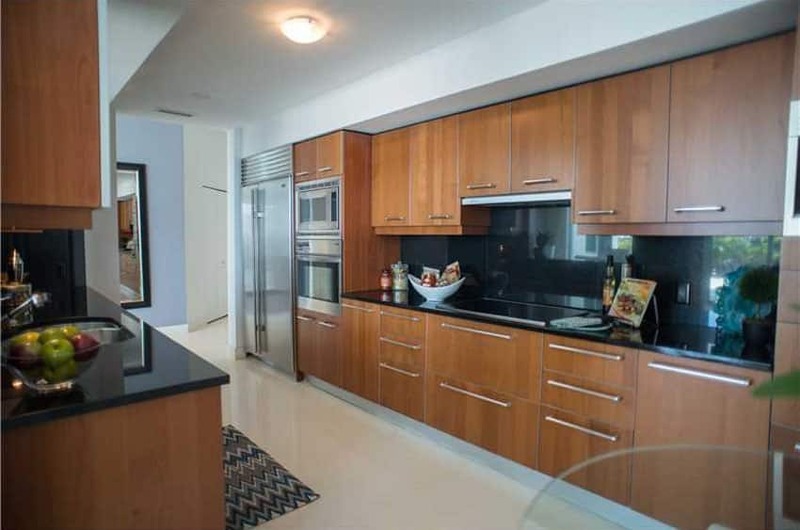 The combination of glossy gunmetal gray cabinets with light maple wood creates a very soft and elegant look. The cabinets employs push-to-open hardware for a cleaner and more seamless look. 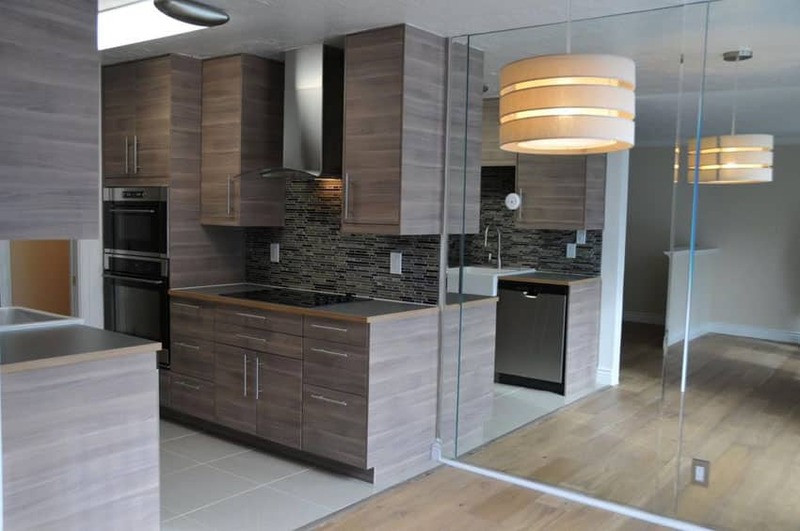 You can see more small modern kitchen designs at our gallery page here.